For the past 69 years, the IRF Fellowship Program has helped change the lives of 1,400 road professionals in 118 countries. These men and women, through our scholarships, have continued their education in areas related to transportation and greatly contributed to raising transport standards and quality of life in their home countries. IRF Fellowships are largely funded through the generosity of corporations, governments and industry associations around the world. To date, IRF has received nearly US $2 million in support of the IRF Fellowship Program endowment fund. But unfortunately, over the past two years, IRF was unable to award all the Fellowships it wanted due to a lack of funds. It was painful to have to tell very highly qualified applicants we could not help them fulfill their dreams of continuing their education because we did not have the funds available. Our goal is to increase our endowment to US $4 million. We need your help to make our goal a reality. Organizations, agencies and individuals can donate at any time. These donors also could create a chair within the Foundation to sponsor students who are considered future leaders in the domain in which these organizations operate. These donors can specify the country and field of expertise for the Fellow. Companies can sponsor potential Fellows from a particular country as part of a multi-year project they are conducting in the country. This will contribute to building local capacity to tackle transportation problems in the said country. Governments and other organizations can sponsor budding transportation professionals from their countries as well as professionals from other countries through the Fellowship Program. The Road Scholar Program is a multi-day program where IRF Fellows experience leadership training under the auspices of the IRF. Fellows also get the chance to meet and network with the who’s who of the transportation world by visiting agencies including FHWA, AASHTO, the World Bank, etc. Organizations, agencies and individuals can sponsor students with a particular area of expertise or home country. Universities and research centers in the United States can form partnerships with international universities to sponsor new students or already enrolled students to become IRF Fellows. The IRF Named Fellowship allows IRF members to identify a potential IRF Fellow studying for a Masters or Doctorate Degree at one of the IRF’s Member Universities and sponsor their attendance at the Road Scholar Program — the IRF’s orientation program for Fellows. This annual multi-day leadership and orientation event is designed to enhance Fellows’ leadership skills with the aim of grooming them into the next generation of transportation industry leaders. For the Named Fellowship program, members are able to meet their organization’s needs by selecting a Named Fellow based on country of origin, university being attended, or area of study. The member is then able to create a relationship with this individual while he or she is in school and build on this relationship when the Fellow returns home. The member will be introduced to the Fellow during the Road Scholar Program and sit with him or her at the Fellows Reunion Dinner. This is a very inexpensive way for IRF members to build up their network of contacts around the world. Most of these individuals also know other individuals from their home countries and the relationships continue to grow. The IRF Fellowship Program needs your help! 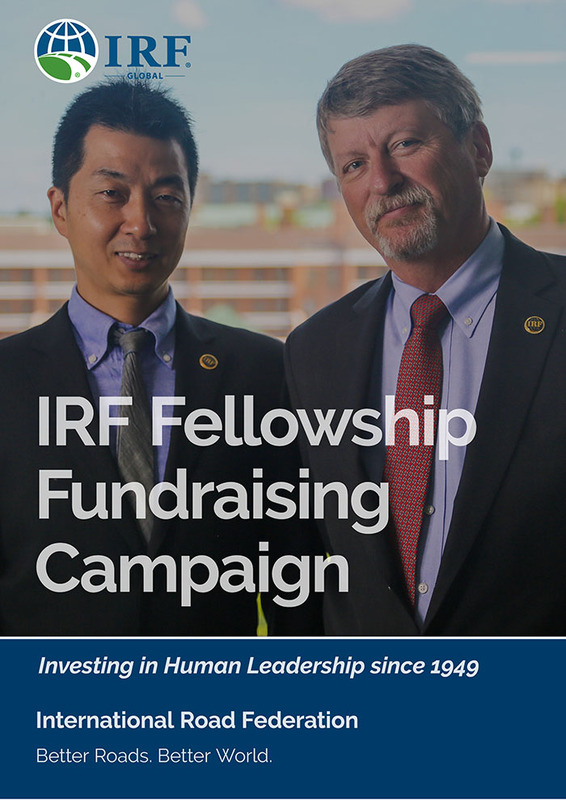 IRF Fellowships are largely funded through the generosity of individuals, alumni of the Fellowship program and IRF member organizations around the world. Unfortunately, the IRF is not always able to award Fellowships to very highly qualified applicants through lack of funds. Individuals and corporations are encouraged to contribute back to the IREF through a donation in support of growing the careers of highly qualified students and help prepare the next generation of transportation leaders.